Turn your coffee mug into a gallery of your cherished photos with our Calypso Photo Mug. Photo mugs are one of the latest products in promotional mugs – they take your branding up to the next level, and give you the opportunity to promote your business in a personal format. This mug is perfect for a promotional coffee mug for your company with photos of your most recent event or company conference, and they also make great gifts for sporting organisations or schools, highlighting your sports team photos or school photos. Our Calypso Photo Mug is a great way to say thanks to your clients. We’ve printed photos of these mugs for a number of occasions – Christmas gifts, end of financial year gifts, giveaways and gifts at conferences and as a great branding opportunity to any of your customers. Recipients love these mugs due to the great style, and long lasting photo print quality. If you are using the photo mug for a gift, or as a promotional merchandise item, they fit perfectly into our Mug Box 1, which can then be branded using custom logo print stickers, giving you an all-round branding opportunity. The Calypso Photo Mug utilises our white Calypso mug which allows your photos to stand out and be recognised. The mug is a great size at 350ml capacity, and is well made and durable which means your promotional mug is going to last. The basic style of the Calypso Photo Mug allows for use in any promotional activity. If your school or sporting organisation needs a fundraiser product or a way to say thank you to your supporters and sponsors, the Calypso Photo Mug is a great way to do it. A printed photo of your club’s or school’s first game day or presentation will look great printed on our Calypso mug, and is a unique gift or fundraising item. The Calypso Photo Mug is a great all-round promotional or branding product which will help get your company, school or sporting club out there in a more personalised way. 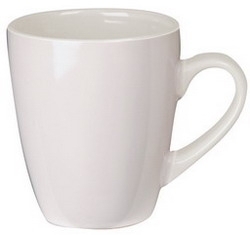 Contact the friendly staff at Ezy Mugs for your next promotional mugs gift purchase.